The most obvious change in the OnePlus 6T could be the design. The upcoming 'flagship killer' will leap ahead of the horde of wide notched phones and will have a 'waterdrop' notch. It's something we have seen in the Oppo F9 Pro, Vivo V11 Plus and even the new Realme 2 Pro. Leaked images of the phone has more or less confirmed the design upgrade. Essentially, the notch won't take up a big part of the display. It will be only be a valley-shaped cutout from the middle, leaving more screen real estate up top to house the status bar icons. A big bummer in the design is going to be the lack of the legacy 3.5mm headphone jack. The OnePlus 6T won't have one. Instead, you can either go wireless or route your audio through the USB-Type C port. OnePlus have confirmed the headphone jack will be sacrificed to make way for newer technologies. Whether that will bode well with the users will be something we'll find out once the phone is out in the wild. In a recent interview to CNET, OnePlus CEO Pete Lau said that the reason the headphone jack was given the axe was to make room for an in-display fingerprint sensor, essentially confirming the same. The next generation authentication tech has been in the pipeline for sometime and we have already seen it in action in a couple of Vivo phones. Instead of rocking a rear-mounted fingerprint sensor, it will be integrated under the display. There are two suppliers of the technology right now - Qualcomm and Synaptics and we have only seen the latter's offering in action so far. We don't yet know who OnePlus has chosen, but it'll surely be interesting to see the company implementing it. So far, in-display fingerprint sensor has not been quite consistent and accurate. Considering everything OnePlus does in their phones boils down to speed, it'll be interesting to see this tech in action on the OnePlus 6T. The dual camera unit on the back of the OnePlus 6 had an identity crisis. The secondary sensor would hardly be used and many claimed it as mere appeasement to the fans. That criticism might not work on the upcoming OnePlus 6T as it's rumoured to sport a triple-camera setup at the back. A three-camera unit is not new. We have seen the Huawei P20 Pro have it as well as the fresh new Samsung Galaxy A7. Both phones use the third sensor differently. It'd be interesting to see how OnePlus will use the third sensor. Although, couple more leaks have pointed that the OnePlus 6T will stick to a dual camera unit. OnePlus has already rolled out the Android 9 Pie-based OxygenOS 9 to the OnePlus 6. The new software has more or less all the features of the latest Android version -- Gesture-based navigation, UI redesign, app slices, and more. Only thing missing is the Digital Well-being feature. The OnePlus 6T can also be assumed to launch with the latest Android version. At the global launch event of the OnePlus 6, the company curiously skipped any mention of Dash Charging, it's proprietary charging tech that can top up the battery super fast. It was later revealed that the company failed to obtain a trademark license to use the phrase as it is similar to what Bragi and Amazon use for their own products. Later, it was found that OnePlus has applied for a trademark for "Warp Charging", indicating that's what it will call its charging tech from now. 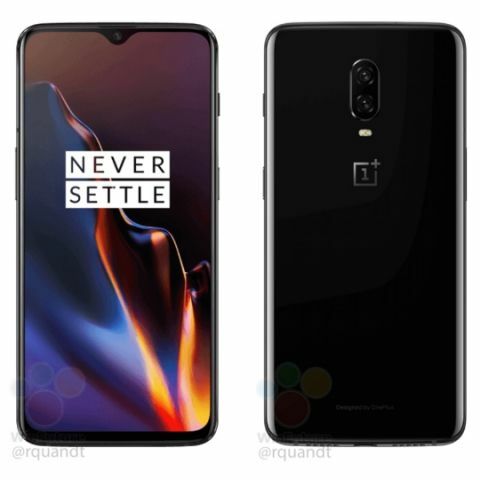 The OnePlus 6T global version is speculated to be priced at $550 (Rs 38,000 approx). The online listing that revealed most of the upcoming device’s specs was selling it for $569, which approximates to around Rs 41,000. However, the device could probably be priced higher by the time it launches, thanks to the depreciating value of the Rupee. While there is a chance that the OnePlus 6T might be launched in October, we think that OnePlus could stick to its schedule and release the OnePlus 6T in November, which is when the OnePlus 5T was launched last year. Additionally, the OnePlus 6T is confirmed to be an Amazon Exclusive in India.